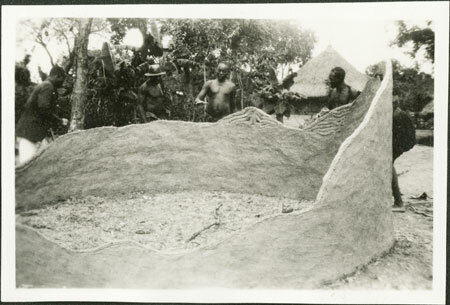 Men building up the clay inner wall of the common hut type known as gbuguru or gbasendeyo, which has long overhanging eaves creating a shaded area. This image shows how the walls are made, with relatively thin strips built up in layers by hand and the exterior smoothed over also by hand. Morton, Chris. "Building clay wall of Zande hut" Southern Sudan Project (in development). 03 Jan. 2006. Pitt Rivers Museum. <http://southernsudan.prm.ox.ac.uk/details/1998.341.361.2/>.